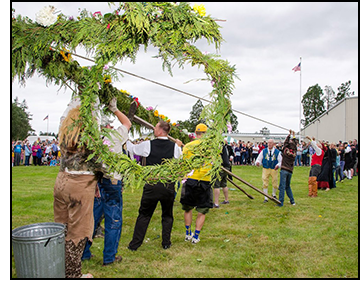 One of the most beautiful things about the Astoria Scandinavian Midsummer Festival is its sense of community. We come together to eat traditional food, we gather by the bonfire, we raise the Midsummer Pole and we dance as a family. And YOU are part of that family! We encourage you to be a part of this great tradition and help us mount another great festival. Some volunteers work year round as committee chair. Others show up the week before festival to help with set-up and decorations. Some volunteers help during the festival by taking shifts at the admission booth, raffle booth, or souvenir booth. The various Scandinavian lodges also seek volunteers to help with food preparation and taking shifts in their booths. We need many hands on Sunday evening to tear down the festival and move equipment to storage. There’s a job for everyone and we appreciate you all. Fill out the following form completely and one of us will contact you to discuss what your special skills are and put you to work! Thanks for your interest and we hope to serve with you in June. Do you have a preference for how you would like to volunteer?